The weather is expected to be fine for the 16th annual Classic Cruise Saturday. Hosted by the Deerbrook Bridge Runners Snowmobile Club, the event will feature a day of fun with vintage and antique snowmobiles, although modern sleds are invited as well. It annually draws hundreds of sleds of various vintages and occasionally a few surprises, perhaps even a spaceship. 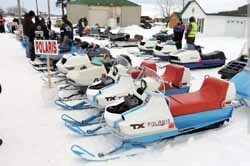 Classic Polaris sleds line up at Neva Corners for the 2018 ride. It will be headquartered at Quinn's Bar in Neva Corners, with registration at 10 a.m. and the ride at noon. The $10 fee includes a commemorative lapel pin, soup and sandwich supper and a chance to win $100. There will also be a raffle for a 1974 Ski-Doo 340 TNT, a great old sled.